The congregation at St. Paul’s Evangelical Lutheran Church, in Utica, began in a log building, establishing a church school as well. Sharing in the use of the log church-school were the German Reformed, the Dunkards, and a Methodist Society, which all were established in 1769. In 1839, the Lutheran and Reformed congregations built a brick church near the log structure, which then was used as a schoolhouse. After many years of use, the church deteriorated and was razed. A new and the current brick church was built on the same site in 1889. 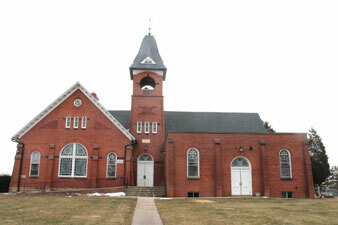 In 1964, the Lutherans purchased the Reformed congregation’s interest in the building. The Sunday School room of that building was rebuilt into a separate educational building in 1966. After over 240 years, the present congregation continues to celebrate this long history of ministry.